This one is known as "the Shambles." It used to be a butcher's lane. It is an extreme (though apparently back then, more typical) example of the close-set nature of medieval houses as they jettied out further and further with each additional story. The idea is that medieval streets had width requirements but nobody kept a check on the air space above it, so you could get some more square footage from your house by building out and up. Neighbors in the opposite windows can literally shake hands across the way, I am told. 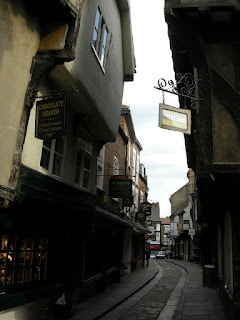 This is another characteristic York street, of the kind known as a "Snickelway." I may have written about these last year on my blog. 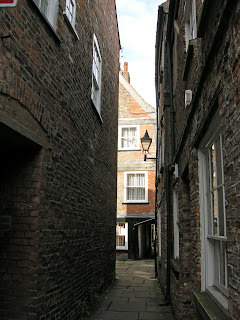 They are charming, narrow, secretive, pedestrian-only passages that cut through building blocks and provide shortcuts.